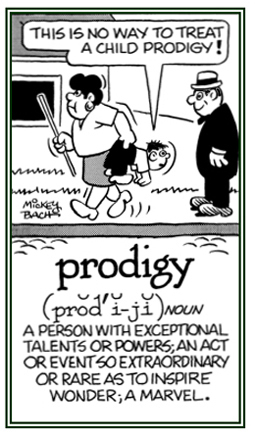 The words in this unit are NOT related to the entries in the prodigal- unit; regardless of what other dictionaries say. 1. A reference to something that is great in size, force, or extent as to elicit awe: The weather forecast indicated that a prodigious storm was coming the next day. 2. Of momentous or ominous significance: The prophet had a prodigious vision about what would happen to the people if the terrorists invaded the country. 3. Pertaining to that which is wonderful or marvelous: Shirley had a prodigious, or a remarkable talent, as a writer. 4. Referring to anything which is beyond what is usual in magnitude or degree: The winner of the quiz program succeeded in achieving the prodigious sum of one million dollars. 5. Extraordinary in bulk, quantity, or degree: The ocean has a prodigious, or an astounding, amount of water. The local newspaper reported that there was a prodigious, or an amazing number, of visitors at the recent art exhibition. 6. Pertaining to being bountiful, profuse, and abundant: There are prodigious numbers of word entries that still need to be completed and/or enhanced in this lexicon. 7. 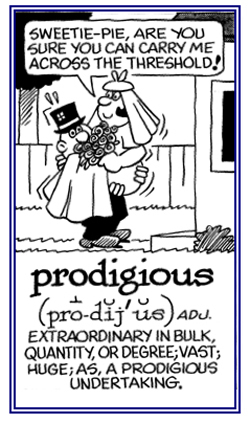 Etymology: from Latin prodigiosus "marvelous" and prodigium "prophetic sign, portent". © ALL rights are reserved. A reference to something that is huge in amount, size, or extent; enormous: As a result of the hurricanes, there has been a prodigiously large number of homes and other buildings that have been destroyed. After the defeat of the French in Canada at the hands of the British in 1759, the French population in Canada increased prodigiously in the 19th and early 29th centuries; however, since the end of World War II, the birth rate of French Canadians dropped considerably, and English-speaking Canada has grown much faster. New York; 1983, page 296. The state or condition of having qualities that excite wonder and astonishment: Mack's son had a prodigiousness for remembering all kinds of facts about when and where historical things happened as far back as the data have been recorded. The writing skills of Isaac Asimov's prodigiousness involved the publications of hundreds of books about science, history, fiction, and many other topics. 1. A person who has, or those who have, exceptional talents or powers: Wolfgang Amadeus Mozart (1756-1791) was a prodigy who could read, play, and improvise music when he was just five years old. Karen, a math prodigy, surprised her teacher and fellow students when she easily solved a complicated numerical problem which was presented to the class. 2. An act or event so extraordinary or rare as to inspire wonder: Gertrude told her parents about a fourteen-year old boy who is a mathematics prodigy and is attending her university. 3. An unusually gifted or intelligent (young) person; someone whose talents excite wonder and admiration: Tom was a prodigy who started playing the piano when he was six years old and then he became well-known as a soloist at the age of fifteen and as a teacher of other aspiring young people. 4. A portentous sign or event; an omen; a sign of something about to happen: The arctic cold was a prodigy that moved down through Canada, and some sections of the United States, bringing very low temperatures and heavy snows that were not normal so early in November. 5. Etymology: a "sign, portent, something extraordinary from which omens are drawn", from Latin prodigium, "sign, omen, portent, prodigy" from pro-, "forth" + -igium, a suffix or word of unknown origin. 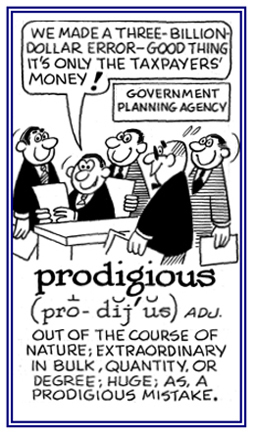 The Roman word prodigium was used to indicate an incident or an extraordinary nature that was recognized as a prophetic sign, whether good or bad, by the entire nation. Then it was adopted into English as prodigy, which at first had the same meaning as the Roman term; that is, as a sign of prophesy. Later it was applied to an extraordinary person or animal, one with great intelligence or talent, and then it evolved into a reference to a child who possessed these qualities. by Robert Hendrickson; Facts On File, Inc.; New York; 1997; page 546. A prodigy is the child who plays the piano late at night when he ought to be in bed. Garden City, New York; 1983; page 477.